An eyewitness to a deadly crash caused by a driver fleeing a Sheriff's Deputy jumps into action. That crash at 13th and Morgan Thursday night claimed the life of an innocent man. A good Samaritan says he was waiting at the intersection shortly after 5 p.m. when saw the suspect plow through a red light and smash into several cars. When the suspect ran off, the good Samaritan went after him. Four mangled vehicles in the middle of the intersection showed the aftermath of a deadly high speed chase. Ryan Mancini, who didn't want to show his face on-camera, had just gotten off work and saw the wreck unfold at the stoplight. "He came up hard and fast, never hit the brake and barreled into these poor people at 80-100 miles per hour like a cue ball smashing other billiard balls," he said. Mancini said the awful crash wasn't enough to compel the 18-year-old driver to stop. 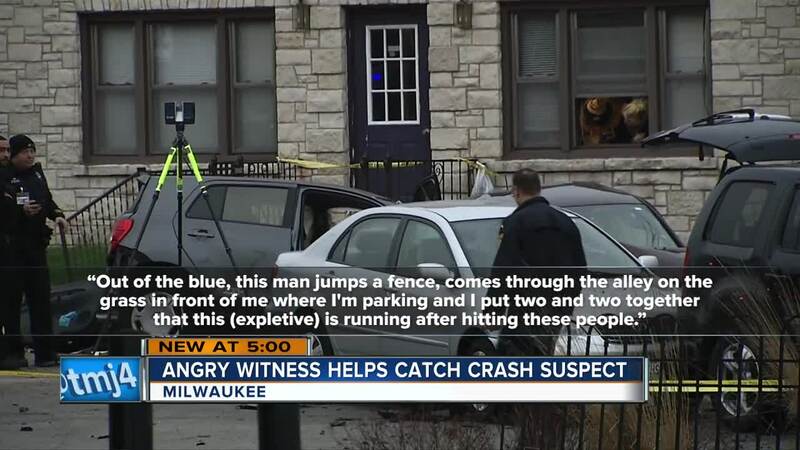 "Out of the blue, this man jumps a fence, comes through the alley on the grass in front of me where I'm parking and I put two and two together that this (expletive) is running after hitting these people," Mancini said. Knowing deputies and first responders were tending to the victims, Mancini went after the driver who ran into a nearby neighborhood. "I was chasing him, I was screaming at him, super upset and yelling at him, you just killed babies, you just killed mothers, you just killed fathers," Mancini said. "At the same time, he's on the ground like a little baby saying, 'I'm sorry, I'm sorry I was scared, that's why I ran.'" Mancini is left heartbroken by the news of the crash taking an innocent young man's life. "It makes me angry and I feel terrible for that 25-year-old man that passed," he said. The victim has been identified by family as Pedro Colon-Ortiz of Milwaukee. His aunt, Poly Rivera, said their family is devastated. "I couldn't believe it, I couldn't believe it because he just went to the bank (dropping off) his sister in his wife," Rivera said. The senseless tragedy leaves a 1-year-old son without a dad and a fiancé without her future husband. "He works hard and he's a family guy, it's sad," Rivera said. The Sheriff's Department has yet to release the suspect's name. The driver and two passengers were taken into custody.